Hello I was wondering who to contact for teenage part time/casual employment at Busabout Smeaton Grange? And if their are possible jobs available for youth at bus depots. PLI wrote: Hello I was wondering who to contact for teenage part time/casual employment at Busabout Smeaton Grange? You could contact Busabout to see if they had anything available. 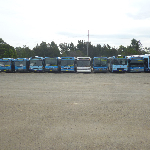 PLI wrote: And if their are possible jobs available for youth at bus depots. I'd really be surprised if there were any at all to be honest, but I might be wrong. Personally, I'd recommend you try the fast food & retail industries if you're in that age bracket. You could be flipping a Flame Grilled Whopper, or stacking the shelves with Kellogg's Special K.
PLI wrote: Hello I was wondering who to contact for teenage part time/casual employment at Busabout Smeaton Grange? And if their are possible jobs available for youth at bus depots. Hi PLI, I am assuming you are in the under 20 age bracket. In all honesty it doesn't hurt asking around, I'm sure someone will point you in the right direction, but it is typically required that interested parties possess or are willing to obtain an MR licence. I'm sure that if you do some research you might happen to be given a good lead.